I’ve become a big fan of apocalyptic stories over the last year. Although I find the idea of these stories completely terrifying, I find myself seeking them out. I don’t normally enjoy getting scared but there is something about the possibility of the story coming to life that really gets my heart pumping. Sip takes place in a world that has become apocalyptic due to people’s ability to drink their own shadow to get high. Once you have consumed your whole shadow, you are unable to sleep without the drinking a shadow. It had become commonplace to steal other people’s shadows which led to the downfall of the world. When our lead character, Mira, hears of a cure to the shadow sickness in which her mother is ailed, she and her friends Murk and Bale set off on an adventure of sorts to find the man who stole her mother’s shadow. Sip is 296 pages long and took me 3 days to read. I give Sip a 3 out of 5 for this creepy/slightly gruesome but totally cool story. 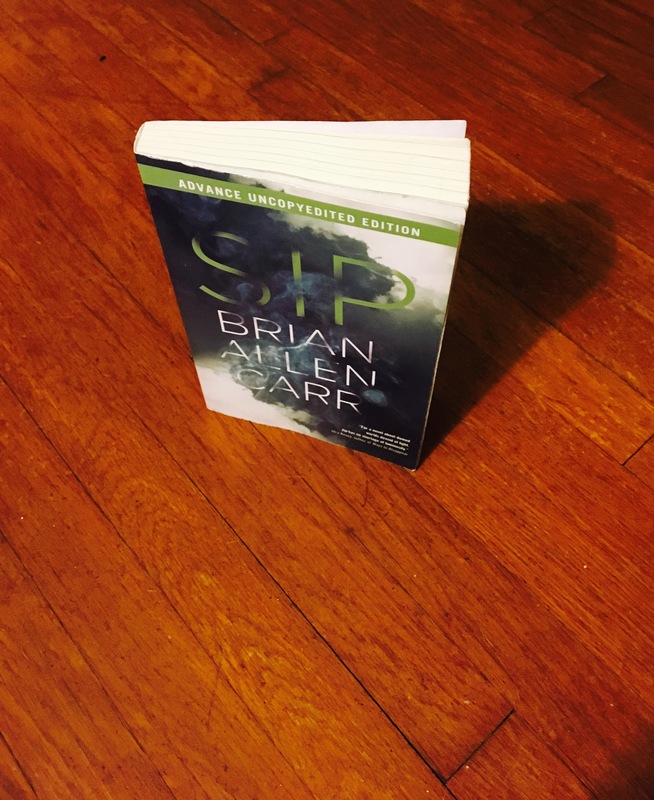 This was my first Brian Allen Carr novel and I really really really hope Sip has a follow up! Thank you so much to Soho Press for sending me this advanced copy!